Continuing my series of memoir snippets as we return from our year and a half living in South Africa. Image found at https://libcom.org/history/1974-1975-the-portuguese-revolution. Not clear when or where this demonstration took place. Presumably Lisbon some time in 1974 or 1975. Our return journey was somewhat different from our original journey south. That had incorporated brief stops at Frankfurt and at Nairobi. There in the grey light of predawn my colleagues and I were allowed to leave the aircraft but not to leave the tarmac. The contrast between the air conditioned cabin and the heat, even at that early hour, of an equatorial summer was stunning. The route was jointly operated by British Airways and South African Airways, the latter company responsible for the return leg. Many African countries were engaged in a boycott of South Africa because of its apartheid policies, therefore her aircraft were not permitted to overfly any of the newly independent African nations. We were, therefore, routed via a refueling stop in Angola, a Portugese colony. Portugal at this time had just undergone a coup, replacing its dictator with a military junta, and as a result the future status of Angola was in question. We were not allowed to remain on the aircraft during refueling and were escorted by armed military personnel to a small bar where we waited under their supervision/protection. The number of passengers was considerably below the capacity of the aircraft which had two consequences, one good, one not so good. The air conditioning, presumably designed to cope with a full cabin of warm bodies, lowered the temperature to something much lower than we were used to. On the other hand, we had 3 or 4 seats each so were able to stretch out beneath airline provided blankets and attempt to sleep; this after watching Goldie Horn in the movie “The Sugarland Express”. If the air conditioning had made us shiver on board the aircraft, the drizzle and sleet that greeted us early in the morning at Heathrow froze us. We quickly settled back into our boring lives in Coventry. Freda obtained a job as a saleswoman on a stall selling women’s wear in Coventry market; her brother sold me a second hand Mini. I worked throughout most of the year on the layout of machines and service pipework for a huge textile processing factory being constructed in Derry. Basically it was an enormous shed which received bales of fibre at one end and delivered fully finished work wear and household textiles at the other. In between were carding, weaving, bleaching, dying, making up, packaging and storage areas, each of which needed one or several of steam, water, air, gas, chemicals and, of course, electrical wiring to the different machines. I discussed the possibility of leaving to take up SAICCOR’s offer with the Technical Director whose attempt to dissuade me included the remark that a project in our Cornwall, Ontario, plant could be about to break. Nothing came of that possibility. Going to live permanently in South Africa, so far from relatives and everything we knew, became less attractive as time went on and I never did take up SAICCOR’s offer. Over the years since I turned 18 I had smoked cigarettes and even, for a while, a pipe. Like most people I occasionally thought about giving up. Whilst in South Africa there was very little incentive to do so because cigarettes were so cheap. We were able to buy premium brands in packs of 200 and did so as part of our weekly shop.They were manufactured using Rhodesian tobacco which tasted quite different from the Virginia tobacco we were used to but we quickly became accustomed to it. Back in the UK price was a significant deterrent to the habit. On the morning of the Monday before Easter I purchased a pack containing 18 cigarettes as this was the pack size available from vending machines at that time. I had a cold which meant that I couldn’t taste anything and smoking aggravated the accompanying cough. By the evening of Good Friday, when we traveled to Hereford to spend the long weekend with Freda’s family, I still had two remaining in the pack. 16 smokes in 5 days surely meant I could manage without. I have not smoked since, one factor that means I am a good deal wealthier and healthier at 77 than would otherwise have been the case. With Ian approaching 10 we decided that, as we clearly were not going to add to our small family, I may as well have a vasectomy, so, one evening in the summer of 1975, I drove the Mini to a private clinic in Leamington Spa, returning a couple of hours later a little sore down below. I’ve heard some men express dread at the idea of such an operation. Take it from me it’s no more painful than a visit to the dentist – indeed, I’ve had far worse experiences in the dentist’s chair. An occasional series in which I share some significant events from my past. This one picks up from where ‘Into the Seventies’ ended. I sometimes struggle to get this next sequence of events in the correct chronological order. There was ‘spot-the-ball’, a mini spending spree and the ending of overtime at work. I’ll begin with ‘spot-the-ball’. This weekly competition, run by the Coventry Evening Telegraph, involved the publication of an action photograph, taken at a soccer match, with the ball blanked out. Contestants were asked to ‘use their skill and judgement’ to estimate the position of the ball. Had the man with his feet off the ground already headed the ball? Was the goalkeeper about to catch it or had it passed over his head? Those were the sort of judgements one was supposed to take into account before marking the centre of the ball with a cross. Suffice to say that one week I won a runner-up prize of £250. To put that into context, it was the equivalent of about two month’s earnings at the time. It meant, among other things, that we could afford to purchase a car. I perused the ‘for sale’ columns in the same newspaper and, after viewing a few of the motors on offer, agreed to pay £80 for an old Hillman Minx. What I was unaware of at the time was that many of the advertisements that purported to be ‘private sales’ were in fact dealers operating out of private residences. Some of these individuals had few scruples and would indulge in various tricks of the trade in order to make a vehicle appear, and sound, much less decrepit than it really was. That seems to have been the case with the two-tone blue and cream Minx. It was not long before I realised that it was using far more oil than it should. By then Freda’s brother was in an informal business partnership with an older chap who restored and resold cars. When I shared my Hillman Minx story with him he asked why did I not go to him? When I did just that, he showed me a Ford Corsair on which the paint finish was deteriorating. Having begun life in dark green livery, the car’s previous owner had decided to re-spray it silver. This second coat had not adhered too well – perhaps the original surface had not been properly prepared. My brother-in-law offered me a tin of bright yellow paint which he assured me was easy to apply with a brush. Meanwhile we decided also to purchase a heating system for the house and a chest freezer which was supposed to save money by enabling bulk buying of various food products. This particular deal included a number of vouchers that had to be spent in a wholesale warehouse in Dunstable. Additional vouchers could be purchased but no actual cash changed hands at the warehouse. We made a couple of trips, before we figured out that the cost of fuel for the journey, plus the interest we were paying on the purchase price of the vouchers, exceeded any saving made on the goods we were buying. I mentioned the ‘Jumbo’ nylon production facilities at Aintree. When the design stage of ‘Jumbo 6’ was completed there was no new project for the team involved to move on to. Contract draughtsmen were the first to be let go but there came a morning when long serving individuals were called into the office to be informed that their services were no longer required. It was a worrying time. I had recently been assigned to a project for the manufacturer of anti-knock additives for motor fuel. As a relatively recent recruit I fully expected that I would be given my marching orders and that a long server would be re-assigned to my role. My relief, when it became obvious that this was not the case, was tempered by the knowledge that colleagues with years of loyal service were discarded. For a long while I had become used to my income being boosted by regular overtime. Now that was no longer available. Freda could not increase her hours because of the need to be at home outside of school time. I found a job as barman in a nearby pub, working three weekday evenings plus lunchtime and evening on Saturday and Sunday. The Convoy public house Image © Copyright David Stowell and licensed for reuse under this Creative Commons Licence. I enjoyed the work. It was quite straight forward with a limited range of products with prices that were easily remembered. There were three bars: the ‘public’ which was mostly male; the lounge, where beer prices were 1p dearer, and the ‘snug’, a small room patronised by an exclusive clientele who were happy to pay an extra 2p for a pint of their favourite tipple in the company of a few close friends. There was also an ‘outdoor’ counter where people who preferred to drink at home could purchase bottled ale or bring their own jug to be filled with draft beer. We did not have the benefit of an electronic till with each product allocated its own button. When someone ordered a large round of drinks we had to memorise, and mentally add together, the individual prices before presenting the customer with the total. We’d then ring up the total before taking any change from the drawer to hand to the customer. The landlord and the other staff were a friendly crowd, as were the regular customers. We were paid for a half hour for clearing up after the doors closed at 10:30. After that the landlord would buy everyone a drink and we would play darts, sometimes for a further hour. No food was prepared or consumed on the premises – apart nights when the darts team were playing a home match. Then the landlady would produce a tray of roast potatoes for both teams and their followers. I don’t recall ever witnessing a fight, nor were there many arguments. I do remember the music that played frequently on the jukebox: Rod Stewart’s Maggie May, Olivia Newton Johns’ cover of John Denver’s Country Roads and the same artiste’s Banks of the Ohio, Joan Baez’ The Night We Drove Ol’ Dixie Down and Cher’s Gypsies, Tramps and Thieves. It’s impossible to listen to any of those songs now without recalling my days working at The Convoy. Cutomer: Hi Bill. How are things? Bill: Fine. Enjoying a nice break. Customer: Oh dear, what’s wrong? Bill: Nothing mate. I get 4 weeks sickness entitlement every year so I’m taking it. I was shocked to discover, when I looked on-line for a photograph of The Convoy, that it has been demolished to be replaced by eight houses. It was, in the 1970s, a friendly local venue where neighbours socialised. I guess it’s a sign of the times that such places have fallen into disuse. An occasional series in which I share some significant events from my past. This one picks up from where 1968 ended. We settled into our new home and I into my job. All the residents of the Stadium Estate were young couples like us, most with children. There was a residents’ association and, before I knew it, I found myself elected chairman, a role no-one else wanted. Courtaulds had, not long before, successfully defended itself against a hostile take-over by another large and successful British company, ICI. The two firms had been joint owners of a nylon yarn producing business, British Nylon Spinners. As part of the settlement of the take-over battle, Courtaulds gave up its share in that business. It could afford to do so because it had been working on its own version of Nylon fibre. The rear view of the former Courtaulds factory viewed from the Melling Road across Aintree Race course. The factory is long since gone, replaced by a retail park. © Copyright J Scott and licensed for reuse under this Creative Commons Licence. Originally developed by a Dutch company, this process was already in small scale production at Aintree. 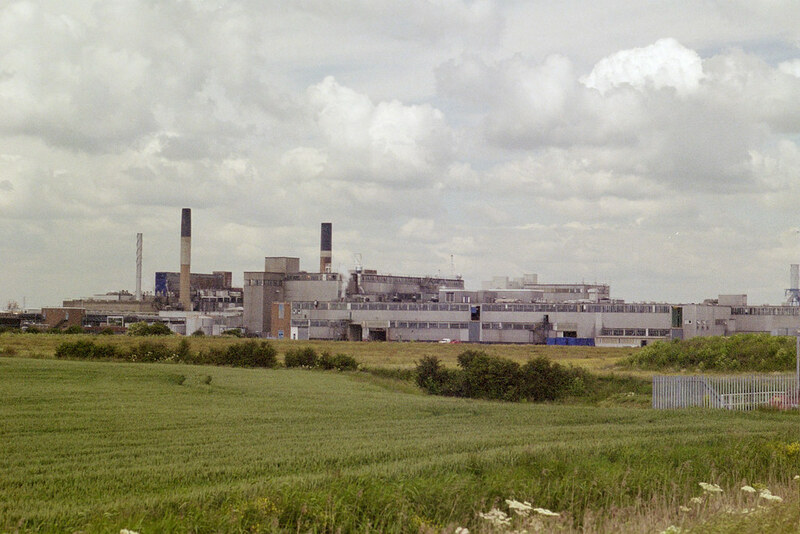 Courtaulds bought the plant and a parcel of land alongside whilst the Chemists and Chemical Engineers in Coventry set about upscaling. The new, much larger, facility was named by the company ‘Jumbo’. The market for the fibre must have been expanding because, by 1968, the office I was assigned to was working on ‘Jumbo IV’. I, however, did not spend many weeks with that team. Soon I was asked to work on the layout of equipment for a solvent recovery plant destined to be installed in the company’s rayon fibre production facility at Carrickfergus, just to the north of Belfast. Once the layout was settled and agreed, the next stage was to produce detailed drawings of individual pipe and duct sections. A small team of contract draughtsmen were employed to do this and my role was to check the drawings they produced and make sure they fitted together correctly on a master drawing. Contract draughtsmen are freelancers who work through an agency on short term contracts – an early version of what, today, would be called the ‘gig economy’. It is, or was, a lucrative, if risky, career. One day I was talking to one of these young chaps and remarked that, although his name sounded Welsh, he did not have a Welsh accent. That is when he told me that he had lived close to the Welsh border for a while as a child. Further discussion revealed that his parents had kept the general store in the next village to the one in which I grew up. This would turn out to be the first of at least two coincidences demonstrating how small the world – or at least the UK – really is. In the autumn of 1969 I accompanied my Project Manager on a visit to the site where the plant was being installed. We needed to understand why some of the ducts wouldn’t fit together the way they were supposed to. It did not take long to ascertain why. A cable tray, which my master drawing clearly showed was supposed to be routed above the duct, had been installed in a straight line. For some reason the installation sequence had been changed – probably because the manufacture of the ducting had been delayed. To keep things moving on site the supports for the electrical cables had been installed before the duct and no-one bothered to ask why the drawing showed it following a rather tortuous route. There had been rioting in Belfast that summer but things had calmed down. Even so, strategically important facilities like the water supply in the hills above the plant were protected by armed military personnel. We completed that trip, there and back, in a day. When the installation was completed, in the early part of 1970, I went over again, this time with the young graduate who had been selected to commission the plant, and stayed for a couple of nights. I have written elsewhere about my encounter with a pair of angry young men during that trip, although it has not previously appeared on-line. For those who may be interested, there is an abridged version here. A lot of the machinery from the old factory would be installed in the new one and we needed to ascertain as much information as possible about it. We were given access to as many drawings and manuals for the existing machines as were available but all of the information they contained had to be checked by comparison with what was on the ground, because changes made over the years may not all have been recorded. Furthermore, there were some machines for which no record existed. The staff at Jacobs at the time were very good to us – they, after all, were the clients and, traditionally it would be we, the contractors, entertaining them. But they were delighted to show us around various popular tourist spots during our first weekend off. We visited Glendalough and Bray Head – I distinctly remember climbing to the top of the Head with snow still lingering under the stone walls. I was very definitely struck, too, by the difference between the two cities. Even then, Belfast’s industrial past was becoming extremely run down, whereas Dublin, never sullied by heavy industry, seemed to retain a more genteel exterior. I have since learned, of course, that that was no more than a veneer, hiding terrible poverty and all manner of cruelty. Meanwhile Ian was due to start school – he was already at nursery – and Freda returned to work as an assistant in a shoe shop. We socialised with several of the couples on the estate. One family in particular introduced us to the Coventry Welsh Rugby Club which became our social hub. We even staged an estate Christmas Party in the clubhouse. And we went on holiday with them. We had treated ourselves to a week at Butlins holiday camp in Minehead at the beginning of the summer. Ian and I came third in the ‘father and son’ competition wearing identical pink paisley print shirts and ties (it was the seventies,after all!). Freda, wearing hot pants, came second in the ‘lovely legs’ competition. Butlins offered us another week, later in the season, for half-price, plus we could bring another family for free. We took them in September to Barry Island and the four children had a whale of a time. But rarely do such good times last for ever, as we were to discover in 1971. *Footnote: This ‘new’ factory closed in 2008 and has since been purchased by Amazon. One of the conditions of buying a house from Hereford City Council was that we were not supposed to sell at a profit, at least, not until we’d lived in it for five years. We could, however incorporate the value of ‘improvements’ within the sale price, with the agreement of the council. I’d built a few cupboards and shelves, we were leaving behind a new, Cyril Lord, fitted carpet and there was the garden that I’d created from nothing. We were, therefore, able to put the house on the market for around £600 more than the original price we’d paid, and had no difficulty finding a buyer at that price. Finding a house in Coventry at the same price was not as easy. For a start you could only get a building society mortgage if you had been saving with the same society for at least 3 months. That was not a problem, nor was the imposed limit of 3 times annual earnings. However the notional 10% deposit required was. Any loan against a house purchase would be a maximum of 90%, not of the asking price, but of the society’s valuation and this was almost always lower. To give a hypothetical example, a house on the market for £4,000 could, in theory, be acquired with a deposit of £400. The building society might value it at £3850, meaning that, unless the vendor was prepared to accept a reduced offer, the purchaser would have to find £535. And then there were solicitor’s fees and agent’s commission, not forgetting any redecorating that might need doing on a house that had been occupied for a number of years. We made one or two weekend house hunting forays to Coventry. Freda’s brother drove us there on at least one such occasion. We looked at a number of prewar houses which, once we took account of the above factors, proved to be beyond our means. Some of these viewings provided our first experience of families whose origins were in the Indian sub-continent. It was not unusual to find that only the children spoke English. The cooking smells, too, were a revelation to us. I can honestly say that we did not find any of this objectionable. Hereford, at the time, had only a handful of families of foreign origin so we had little experience of alien cultures*. Nevertheless, the presence of such diversity was one of the attractions of the move to Coventry. Hereford, by comparison, seemed backward. Not withstanding the cooking smells, there was no doubt the homes of Asian families in Coventry were clean, something that I could not say about some homes I’d visited on a regular basis during the preceding couple of years in my role as collector for a football based charity lottery. In the mid-fifties a producer of nickel alloys established its manufacturing base in Hereford. Over the following years the company’s old units in Birmingham and Glasgow were closed and a number of employees moved to Hereford where many were housed in the same estate on which we had purchased our house. I recall being horrified by the condition of a few homes I visited; just a few years old yet the front doors were filthy. On at least one occasion I saw a front door with a large hole caused, like the muck, I suppose, either by a football or a boot. When the door was opened the person doing so would be followed by a blast of warm, fetid air ripe with the smell of dog. After looking at several preowned homes it became obvious that our best bet would be to find a newly built house on a modern estate. One such was almost complete on a site previously occupied by Coventry’s greyhound stadium. The Stadium Estate was a relatively small development consisting of semi-detached and terraced houses and a couple of two story apartment blocks, between Holbrooks Lane and Lockhurst Lane on the North West outskirts of the city. There was a bus stop within comfortable walking distance, on Holbrooks Lane, making access to the city and my place of work easy. The house we purchased was at the end of a block of 3 next to a junction between two culs-de-sac. There was very little garden at the front, most of which was occupied by a car port. There was, however, a modest area at the back which I could turn into a garden. You will recall that I had given up on motoring upon getting married some five years previously. Working for Denco Miller I occasionally drove a car from the company pool. To get to Cambridge and Coventry for my interviews I hired a Mini. With its low centre of gravity, front wheel drive and innovative suspension, the Mini was especially good at going around corners fast. I remember boasting at how quickly I’d covered those two journeys, neither of which included sections of motorway. That network, in the UK, was still in its infancy. For the first five months of working in Coventry I used the bus; departing Hereford on Sunday afternoon and returning Friday evening. But for the weekend of our move I needed a car to convey wife, child and those domestic essentials that we would need whilst unpacking the big stuff from the furniture van. The car rental company in Coventry didn’t have a Mini available but could rent me a brand new Morris Minor. Although new, this vehicle was based on outdated technology and was far less manoeverable than the Mini, as I was to discover to my cost. One of the recent additions to the embryonic motorway network, the M5, crossed the road I had to travel. A new bridge had been constructed with a wide approach for maybe 50 metres either side, after which it reverted to its narrow, winding norm. It was November, dark, damp and, possibly, icy. I accelerated on the wide section of road and entered the first half of an ‘S’ bend traveling much too fast. This meant I was on the wrong side of the road approaching the second half of the ‘S’. I mounted the grass verge and was brought to a stop by the hedge. I mentally sighed with relief and began to wonder where I could find someone to tow me out of the hedge. I felt the car start to tilt and at once I was upside down then the right way up, with the sound of water trickling somewhere. The driver’s side door was jammed against a grass bank and would not open. I clambered across to the passenger door and exited the car. I had left the road on the right hand side so the road should now be on my left. The spin made me think the car had turned around to face the wrong way. So I climbed over the bonnet of the car to ascend the bank on the driver’s side and found to my surprise I was in a field. When I eventually made my way onto the road I could see the lights of a building about 100 metres ahead. Somewhere, I hoped, where I might get help and access to a telephone. I realised that my back was wet. I could not sense any injury – later I discovered a graze on my left hip left by the seat belt. The building whose lights had attracted me revealed itself as a pub. I explained my situation and was pointed to a telephone from which I called the police to report the accident (necessary for the rental company’s insurance) and a neighbour to let Freda know I was unhurt but would be home late. Could she contact her brother to come and get me? I was quite shaken by the experience and asked the pub landlady for a large whisky. She sensibly advised against alcohol until after the police had talked to me. The following morning I had to hire another car in Hereford for our journey to Coventry. On the way we stopped to look at the Morris Minor and rescue some of my belongings from it. The back window had shattered as the car rolled into a deep ditch beyond the hedge. Everything was soaked in stagnant, evil smelling water. There was no doubt that I was very fortunate: firstly that there was nothing coming from the other direction when I crossed the road and secondly that I was uninjured in the subsequent roll-over. The car was invisible from the road and, had I been immobilised, I could have lain there all night. *I ought to add that one of my colleagues at Denco Miller, a highly intelligent and educated young Engineer, was Indian, having graduated from one of India’s universities before completing his Masters degree in London. As a Proposals Engineer he had set up one of the contracts that was handed to me to execute and I remember traveling with him to London for a meeting with the client and being introduced to some of his University friends at an Indian restaurant. September 17, 2018 12:32 am / 6 Comments on Monday Memories – 1968. An occasional series in which I share some significant events from my past. At work, after completing my apprenticeship, I was designing components for eventual incorporation into the ill fated TSR2 defence project and the highly speculative super-sonic airliner Concord (Concorde if you are French). TSR stood for ‘Tactical Strike and Reconnaisance’. I’ve no idea why it was designated ‘2’. I suppose there must have been an earlier version of this aircraft. In any case it was cancelled, being deemed too expensive at the time. There were four of us ex-apprentices within a couple of years of each other, each of whom got married in 1963 or ’64. As well as watching Hereford United football and socialising in the club’s Supporters’ Club we organised a couple of events of our own. One ‘initiative test’ involved lads being dropped off at various points on the outskirts of Chester. This was at 10pm and the task was to make our way back as quickly as possible. In another we set off at 8pm with the objective of getting as far away from Hereford as possible and back by 6pm the following day. This demanded judgement as well as initiative, determining when and where to commence the return journey so as not to be disqualified for being late. I and my partner achieved creditable results in both. In the second we made it to a village called Misson in the northern corner of Nottinghamshire, not far from Doncaster. I remember a friendly policeman who stamped our form to confirm we had been there and treated us to a breakfast of tea and bacon butties in the kitchen of a factory making cattle feed pellets from grass. Apparently this was part of his morning routine. At some point the company recruited a young draughtsman to augment the team of design draughtsmen. Originally from Lancashire, he was quite ambitious and would prove to have a significant, if indirect, impact on my future career. He quickly found a better paid job with another firm based in Hereford, Denco Miller Ltd. The parent firm, Denco, had begun life just after the war manufacturing lubrication systems under licence from an American company. At some point they were approached by a refrigeration engineer called Alan Miller who saw an opportunity to use the principle of refrigeration in various industrial applications. Denco Miller was the result of this collaboration. The company produced air conditioning plants for the burgeoning computer industry, and compressed air drying systems for manufacturing plants that used tools powered by compressed air. The company had just begun selling gas drying equipment to the nationalised regional gas companies who were converting from coal to oil as the source for gas production. Marketed as ‘High Speed Gas’, this was a precursor to the yet to be discovered North Sea Gas. Delivered under pressure via a nationwide network of pipes, it replaced the low pressure distribution of coal gas which was stored in large tanks, or ‘gasometers’, which could be seen in every town of significant size. The nation’s town and city streets were being dug up to install these new pipes to deliver High Speed Gas to homes, and a programme was underway to convert domestic appliances to use the high pressure supply. Denco Miller’s business was booming because of this and my former colleague was appointed as the new Chief Draughtsman and set about recruiting other colleagues. I succumbed to his felicitations, not so much a promise of higher earnings at once, but a near certainty of early promotion as the business expanded. So it was that, in February 1966, after a total of seven and a half years at the company where I had served my apprenticeship, I left to join Denco Miller. Sure enough, within a few months I was promoted to the role of Contract Engineer. This meant I was put in charge of supervising the delivery of various projects from conception to commissioning. Many of the new Synthetic Natural Gas production facilities were constructed as an integral part of an oil refinery and there were, at that time, a number of such projects underway in Britain. Such vast projects were managed by large companies using American project management techniques which could quite easily make mincemeat of small enterprises like ours working as sub-contractors. I was certainly not up to the job of negotiating with their Project Managers. Contracts tended to be priced low to ‘get a foot in the door’ in the hope of getting future business. My job was to screw as many concessions and payments for ‘extras’ as possible from the client, theirs to screw as much out of us as possible without paying more than the originally agreed price. After one particularly difficult contract that lost money for the company I was ‘redeployed’ back to the drawing office. This made me determined to look for employment elsewhere – and I was in no doubt that it would have to be away from Hereford. The first alternative opportunity I explored was as a Technical Journalist with a weekly publication called, I think, Engineering News. I went to their offices in London for an interview and was offered a job, but it would be at the same salary as I was already earning. The idea of trying to live on such a salary in London with its inflated housing costs simply did not appeal. I had responsibilities and we were managing reasonably well in our rural backwater. It was not just the cost of living that deterred me from moving to London – traffic noise and fumes, over-crowded buses and Underground trains, and too many people crammed into poor quality housing seemed like a bad idea by comparison with our little house and garden a stones throw from open country. A few months later I travelled to Cambridge to an interview with the electronics company Pye. They wanted someone to design equipment enclosures and manufacture prototypes. I would have access to a small workshop but would have to do the prototyping myself. Memories of some of the mistakes I’d made whilst working in various machine shops as an apprentice made me have second thoughts about that job. I can best illustrate this by recounting an incident from my period in the so called ‘Short Order Department’. This was where small batches of components were manufactured, quantities that did not merit the expense of creating the tools and jigs required to produce large numbers of a particular set of components. As well as a number of basic machine tools, the department had a bench were certain items were hand made by a craftsman. Geoff was one of the nicest men I met during my apprenticeship or since. A Scotsman, he had been mechanic to the Allard motor racing team after the war. He was not only a master craftsman but also a wonderful mentor and teacher for those of us apprentices fortunate enough to work alongside him. Upon my arrival in the department and introductions, he Christened me “Squire Parker from Peterchurch”. From then until the day I left the company I was known as “The Squire” or “Squire Parker”. There is a technique for using a pillar drill which is one of the first, most basic things, a user learns. The object to be drilled needs to be supported so that when the drill bit exits the object it does not enter the table of the drill. Despite this, many of the old pillar drills with which various departments were equipped were peppered with holes left behind by individuals who had ignored the rules. One day the Short Order Department was treated to a brand new pillar drill. A few days later I was allocated a task which necessitated drilling a hole in a piece of aluminium. Everything was going fine until I noticed the silver coloured alluminium swarf from the drill had been replaced by dark grey slivers. I felt the heat rise from my neck to my cheeks as I realised the error of my ways. I can well imagine that some of the craftsmen and supervisors alongside whom I had worked previously would have been unable to hide their anger at such incompetence and the spoiling of a new, expensive, piece of equipment. Not Geoff. Of course, he gave me a well deserved lecture. But he also set about finding a suitable piece of steel bar and then creating a deliberate hole in place of my accidental one. This new hole was a tight fit for the piece of rod which Geoff drove into it, filing and polishing until my mistake was completely erased. One of Geoff’s favourite remarks was “Bloody hell’s bells (name) what d’ye think ye’re doing?”. A phrase he used that day, accompanied with a lesson on taking the trouble to do things the right way. To get back to my job search, the day after my trip to Cambridge I went to Coventry for an interview with Courtaulds Engineering Ltd. The textile conglomerate was undertaking a massive investment in its many plants around the country and further afield, as well as offering the services of its Engineering subsidiary as Project Manager and Design Specialist to other organisations. I was offered both of these jobs and chose the one in Coventry, not least because it was not too far from our original family homes in Herefordshire. It also meant a higher salary at a time when there was a government imposed cap on wage increases. I began work at CEL in June of 1968. We sold our house and purchased one in Coventry which we moved into in November. I was to spend the next 18 years as an employee of Courtaulds Group, in various locations and capacities. The Beast from the East, February 1979. February 27, 2018 10:48 am / 9 Comments on The Beast from the East, February 1979. It had been cold all week up to now. A brutal North Easterly wind scoured the coast in sub-zero temperatures under leaden skies. I was working in Grimsby, awaiting the board’s approval of my permanent posting, still travelling back to Coventry at the weekends. That Thursday morning, St. Valentine’s Day 1979, was no different to any other that week: still bitterly cold as I left the guest house at 8am for the twenty minute drive to work. As I crossed over the traffic lights where Grimsby Road, Cleethorpes, transforms itself into Cleethorpes Road, Grimsby, I felt the wind rock the car and saw the first flurries of snow caught in the headlights’ glow. By the time I reached the next set of lights, at the junction with Freeman Street and Fishdock Road, the traffic seemed to be at a standstill, nothing moving when the lights changed. The snow was still fine and light, though driven by that bitter wind. There was now a light dusting of white powder on the road being picked up and swirled around by the wind, mingling with the steam from vehicle exhaust pipes. Eventually the traffic in front of me began to move forward slowly. I switched into the right-hand lane by the derelict Alexandra Theatre, ready to turn right onto the swing bridge. As I made the turn into the wind, the snow began to plaster the windscreen and I turned on the wipers. Beyond the swing bridge, the road climbs briefly. It was here that I discovered the cause of the hold up. Heavy vehicles were struggling to negotiate the incline, their rear wheels spinning, causing them to snake slowly forwards. Beyond the dock estate the road to the plant runs parallel to the coast, about half a mile inland. That half mile consists of a flat cultivated field – or it did then. The field is separated from the road by a low hedge and a ditch. Here I was to learn the meaning of the expression ‘white out’. The road, the sky, the field, were all white. Snow flakes swirled around the car. The only guide I had, as I covered the mile or so of straight road to the plant entrance, was the red glow from the rear lights of the car in front of me. Its driver, like me, an employee arriving later than usual to work that morning. My morning routine, having arrived in the office, was to take a walk around the various projects for which I had responsibility. This necessitated a quarter mile walk outside. I donned waterproof over-trousers, wellingtons and a hooded waterproof, carrying the hard hat and goggles I would be obliged to wear inside the plant. Snow stung my face and I turned my head to the side so that the hood took the brunt of the storm’s blast. Where the internal factory road turned a corner between two buildings set at an angle to each other, snow was piling into a huge drift. By noon I was back in the office, nursing a mug of hot tea. In the meeting room all eight of us Engineers were gathered around the conference table to hear the Chief Engineer explain that the road leading to the plant was completely blocked, the narrow channel between low hedges creating the perfect repository for every flake of snow the wind scoured from the farmer’s field. Nothing could get in or out of the plant. No deliveries, no collections. Of greater importance was the fact that a change of shifts was due at 3pm. The road needed to be open, both to enable the employees due to arrive to do so, and to ensure those leaving were able to do so safely. The plant generated its own steam and electrical power by means of a bank of nine boiler and generator sets, 4 coal powered, 5 oil fired. The company employed two large bucket loaders to move coal around the yard. It was agreed that one of these would be deployed to clear the road. The cars belonging to incoming employees would be held at the entrance to the road, then led in, in convoy, behind the bucket loader. The loader would then lead the vehicles containing departing workers away from the plant. This process would be repeated as often as necessary to complete the change-over. With this operation completed, the day staff, officially due to leave at 5pm., would be led out. Finally, those of us who would normally leave at 5:30 would be led out. We were left in no doubt that this operation would take some considerable time and that we would likely be here until well after six. There are 3 other plants, further North along the Humber Bank. Two produce Titanium Dioxide and the other, fertiliser. I learned the following day that staff at one of those had been unable to leave their plant and remained there over-night. I had hoped that, by Friday afternoon, the roads out of Grimsby would have been cleared. They were not. So I had to spend an extra night in the Cleethorpes boarding house, journeying to Coventry on Saturday morning. By my return on Monday morning most of the snow had cleared, just the drifts under the hedges remaining. And here is an odd thing. Four weeks later, on Friday 15th March, there was another heavy snow storm that prevented me travelling to Coventry until Saturday morning. That was a bigger blow, personally, than February’s winter blast had been. My son, Ian, was a scout and was in the Gang Show company. Their show was playing Saturday night in the Coventry Theatre. I had to be there. More than that, the plan was that I would drive to Hereford on Saturday morning to collect my mother and her husband so that they could see her grandson’s performance. That part of the plan had to be abandoned, but I did get to see the show.